Formed by two French doctors in 1982 to help Cambodians seriously injured by landmines, Handicap International now provides crucial assistance to those disabled due to armed conflict, natural disasters, injury, disease and poverty. Presently working in over sixty countries worldwide, the organization has been responsible for a discernible shift in the way the humanitarian community, including donors, deals with a previously under-served constituency. 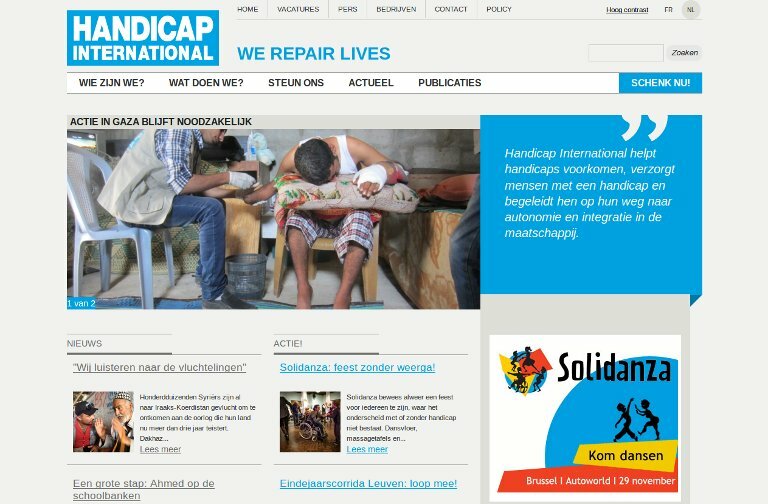 Guided by a rights-based approach, Handicap International runs projects in six main areas: emergency relief, humanitarian de-mining and risk education, rehabilitation, prevention of disabling diseases, social inclusion and disability rights and discrimination. Eschewing a top-down model, the organization uses local resources to work with community partners, with whom it shares knowledge, builds systems to prevent disability, treats those in need and advocates for inclusive development. At the international level, Handicap International has been especially effective in raising awareness of critical issues facing the disabled and advocating for policies that address their specific needs. The organization was instrumental in the conclusion of the UN Convention on the Rights of Persons with Disabilities and co-founded the International Campaign to Ban Landmines that led to the adoption of the Mine Ban Treaty.